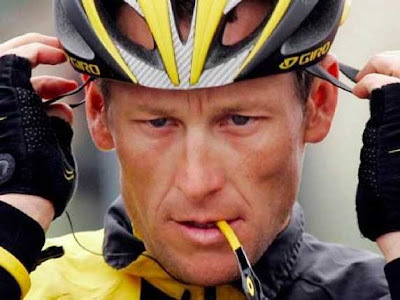 Cyclist Lance Armstrong is stripped of his 7 Tour de France victories ~ ESCRITORES POR EL MUNDO . n an affirmation of the U.S. Anti-Doping Agency's actions against Lance Armstrong, cycling's international governing body stripped the American sporting icon of his record seven Tour de France titles and banned him from competition for life. In an unequivocal affirmation of the U.S. Anti-Doping Agency's actions against Lance Armstrong, cycling's international governing body Monday stripped the American sporting icon of his record seven Tour de France titles and banned him from competition for life. In announcing the decision at a news conference in Geneva, Pat McQuaid, president of the International Cycling Federation (UCI), was unstinting in his condemnation of Armstrong's pattern of doping, deceit and bullying USADA had documented. "Lance Armstrong has no place in cycling, and he deserves to be forgotten in cycling," said McQuaid, also a former competitive cyclist. "Make no mistake, it's a catastrophe for him, and he has to face up to that." UCI had little option but to concur, given the breadth and depth of the evidence USADA compiled that was based largely on firsthand accounts of 11 former Armstrong teammates. Had UCI disputed the agency's report, whether on the merits or over matters of jurisdiction, Armstrong's disciplinary fate would have been appealed to the Court of Arbitration for Sport. But with its concurrence, UCI effectively snuffed out any hope of the 41-year-old Armstrong to salvage his cycling achievements or the iconic status that won the Texan millions of followers, and earned him millions in corporate endorsements, since winning the first of his seven consecutive Tour de France championships in 1999. "We wish that there is no winner for this period," Tour director Christian Prudhomme said in Paris. "For us, very clearly, the titles should remain blank. Effectively, we wish for these years to remain without winners." Prudhomme wants Armstrong to pay back prize money from his seven victories, which the French cycling federation tallied at $3.85 million. Armstrong also once was awarded $7.5 million plus legal fees from Dallas-based SCA Promotions Inc., which tried to withhold paying a bonus for his 2004 Tour victory after it alleged he doped to win. The losses pile up for Armstrong, who dedicated himself to victory — over other cyclists and the cancer that almost killed him in 1996. Armstrong was defiant in August when he chose not to fight USADA in one of the agency's arbitration hearings. He argued the process was rigged against him. "I know who won those seven Tours, my teammates know who won those seven Tours, and everyone I competed against knows who won those seven Tours," Armstrong said then. "The toughest event in the world, where the strongest man wins. Nobody can ever change that." UCI's decision represented vindication for USADA and its CEO, Travis Tygart, who has long stood accused of pursuing a vendetta against Armstrong and overreaching the agency's authority in doing so. UCI had backed Armstrong at times in trying to take control of the doping investigation from USADA. "Today, the UCI made the right decision in the Lance Armstrong case," Tygart said in a statement. "Despite its prior opposition to USADA's investigation into doping on the U.S. Postal Service cycling team and within the sport, USADA is glad that the UCI finally reversed course in this case and has made the credible decision available to it."